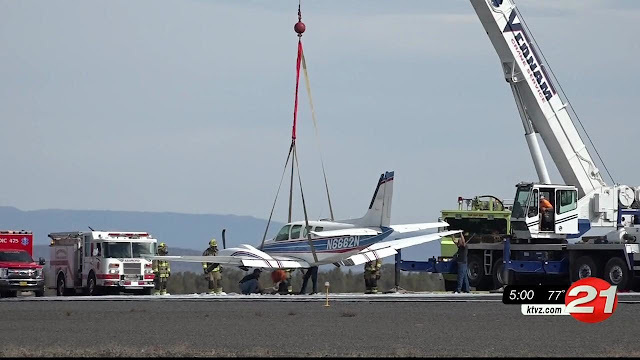 REDMOND, Ore. - A twin-engine plane whose pilot was unable to lower the landing gear made a gear-up emergency landing at Redmond Municipal Airport early Friday afternoon. That prompted a halt to takeoffs and landings until the plane could be removed from the runway, delaying or diverting more than a dozen flights before it reopened three hours later. Airport Director Zachary Bass said the pilot of the Beechcraft Baron plane told air traffic controllers shortly after noon that the landing gear would not come down. He circled the airport while the airport's ARFF (aircraft rescue fire fighting) units and others were positioned in place, should the need arise. Fire crews on scene reported some light smoke as the aircraft slid down the runway on its belly after landing and came to a stop, and an ARFF unit deployed foam to prevent any fire, with the pilot getting out moments later. Redmond fire officials said the plane's landing gear malfunctioned and made a successful gear-up landing with the pilot uninjured. Crews were making sure there were no hazards while the plane was removed. An aircraft spokeswoman said the plane belly-landed on Runway 5, with no one hurt. The airport does have two runways, but Bass said the plane blocked the primary runway. The airport’s second runway has been under reconstruction since May, a project expected to be completed in mid-October. The airport's flight status page had showed several departures delayed through about 3 p.m., as well as several arrivals. At least seven arrivals and 10 departures were delayed due to the incident, with some of the incoming flights diverted elsewhere. A crane was brought in and helped crews get the plane back onto its wheels so it could be towed off the runway around 2:30 p.m. Airport officials said flights resumed around 3 p.m., after crews washed the foam off the runway and prepared it for service.